The riders were feeling surprisingly strong on the second to last day. Sure, the muscles were sore and the bodies tired, but they have settled into the climbing mentality. They were particularly geared into Parkway landmarks and mile markers. Julie said that she looks for gaps, overlooks, and state parks. Gaps are usually not good because they mean the descent is over and a climb will be coming. Overlooks are usually at the end of a short climb, while parks are usually at the end of a big climb. Today’s route would take us further into the Black Mountains, including the highest in all of the Appalachians, and we would leave via the Craggy mountains, descending into Asheville. 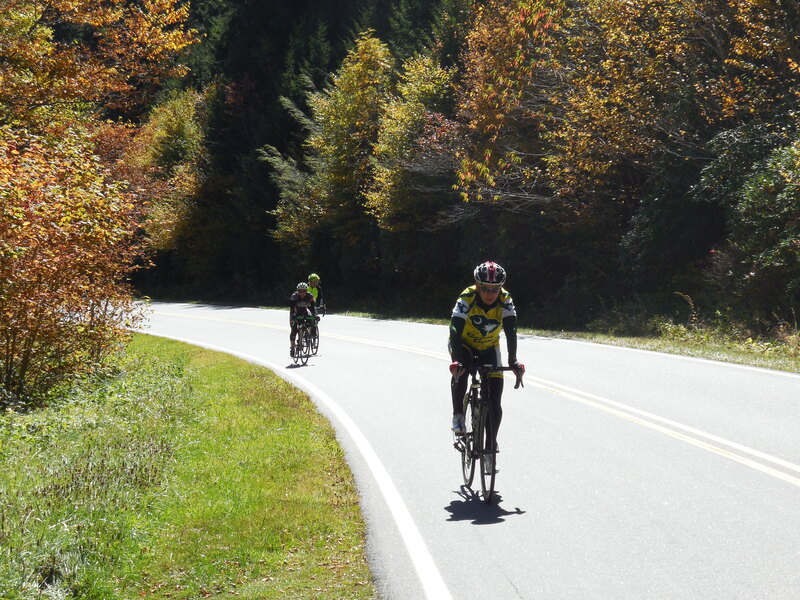 There would be lots of gaps and overlooks in the early going, and one state park – Mount Mitchell. That would mark the end of the big climb, and the beginning of the big descent. The climbing was top-loaded. There was some up and down from Linville Falls to Little Switzerland, maybe a little bit more up then down. By the first rest stop at the Black Mountain overlook, we were about 1,000 feet higher than we started, with plenty more to come. Along the way there were plenty of familiar, distinctive sites. In the far distance towards the east, we could see Table Rock and Lake Lure. To the west, we could see the the towering ‘Sixers’ in the Black Mountains. At Buck Creek Gap, the terrain became quite familiar to Assault on Mount Mitchell riders. This is where that route enters the Parkway from Highway 80. From there it is usually a slow grind to Mount Mitchell State Park. That grind today was even slower. This segment of the Parkway is the one that I am most familiar with. Today, however, it looked completely different. As we climbed higher, the colors really jumped out. The reds, oranges and yellows were overwhelming. I’ve also never been on the Mitchell route with weather this good. It was bright, sunny, and 60 degrees. We couldn’t ask for better weather, which has been a continuing theme this entire week. The parkway climb is tough, comparable to the big climb they did on day one, and a couple that they’ll do tomorrow. The road just continues on and on, seemingly endless. Julie’s theory doesn’t stand up on the route to Mitchell, as there are several overlooks, but the road continues upward. The views help, as you can see smaller mountains and valleys on one side, and as you get closer to Mitchell, you can see it and other large mountains in the distance. The colors continued to get better as we climbed up to 5,000 feet to make the turn into Mount Mitchell State Park. The Mitchell summit wasn’t quite as colorful, mostly because of the depleted trees (long story). The view, on the other hand, was indescribable. I’ll let the pictures do the talking. Bobby and Christian laid down the hammer heading into the Mitchell State Park, zooming by everyone. Guy was shortly behind them, followed by the rest. Bobby pushed hard on the climb, and eventually Christian fell behind. No shame in getting dropped by one of the top cyclists in the area. Everyone finished excited and spent at the same time. Some of the guys had climbed Mitchell for the first time. This was Julie’s third time to the summit, all from different starting points. Wes got some revenge, having cramped up earlier on the Assault. This time he had it easy, and cruised up to the top. Bobby has probably been up there 20 times this year, and probably broke his own KOM with this attempt. That’s saying something when there are over 1,000 riders listed on Strava. As if climbing to Mitchell wasn’t enough, Nancy decided to do pushups at the elevation sign. Not to be outdone, Julie did the same. We descended via Craggy Gardens along the Mitchell ridgeline, which was pretty impressive. There were two little bumps on the way. They called them ‘heartbreak hills,’ before a wicked descent all the way back to Asheville. The Craggy area was particularly vibrant, with a lot of bright yellows. It was just absolutely gorgeous riding (and driving). Now we’re in Asheville, back to civilization and cell phone coverage, with one more day remaining. This entry was posted on Thursday, October 10th, 2013 at 7:30 pm	and posted in Blue Ridge Parkway. You can follow any responses to this entry through the RSS 2.0 feed. Hey Aaron, I just returned from an eight-day cycling tour of the Alleghany Passage and C&O Canal from Pittsburgh to DC and met tourists who have done the Blue Ridge. They spoke so highly of it that I know I will one day be there. Keep writing, you’ve got me hooked. Sounds like a fantastic trip. I hope you’ll write about it. The Blue Ridge Parkway is fantastic for cycling. You’d love it! Aaron, do you happen to have a strava link for this day? Thanks. Hope the healing process continues! Going to head up to Tryon this weekend for a ride in the leaves myself. Stoked! Thanks, Ed. I forgot to post the Strava for that day. You can use this link, which I also edited into the post. Good luck with the ride in Tryon!